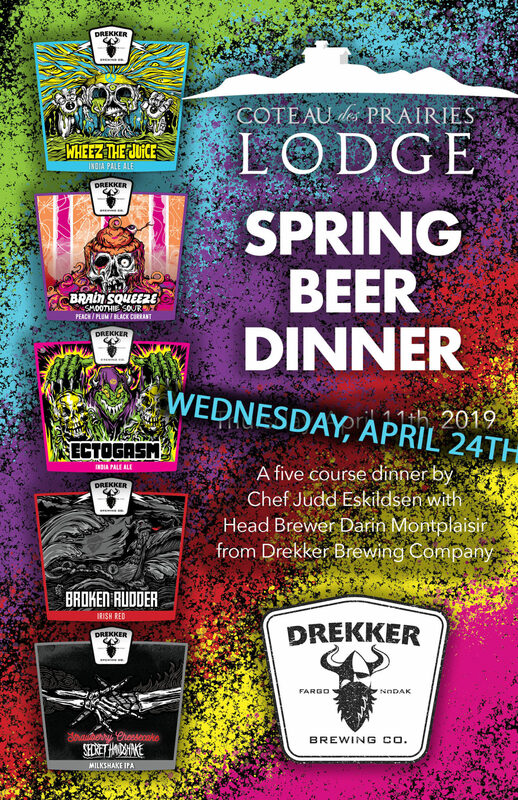 On Wednesday, April 24th, 2019, we are hosting Drekker Brewing Company at our Spring Beer Dinner! Drekker Head Brewer Darin Montplaisir will be introducing his amazing beers. Guest Chef Judd Eskildsen from Brew Restaurants (Fargo) is planning an awesome five course pairing menu. Drekker Co-founders Mark Bjornstad and Darin Montplaisir dine at our 1st Drekker Beer Dinner. 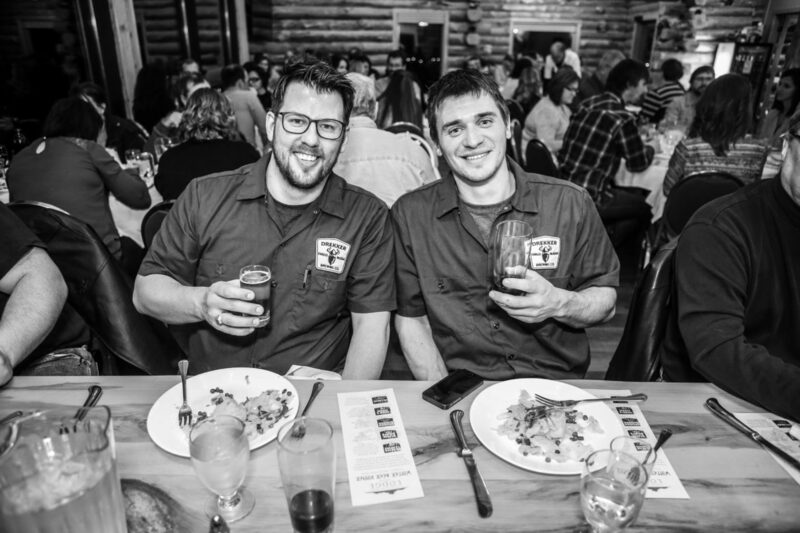 This brewery/chef combo debuted at the lodge on January 22nd, 2015, shortly after Drekker opened. Between Drekker’s crowd pleasing beers and Chef Judd’s generous portions, Drekker’s second appearance at the lodge will be memorable! Drekker Brewing Company was one of the early craft breweries on the scene in Fargo’s “craft brewing renaissance”. Beer lovers crave Drekker’s unique beers from their ever changing lineup and their two taprooms are must see destinations when visiting Fargo. Be sure to visit Drekker’s super cool new location “Brewhalla”. It’s a historic warehouse near downtown repurposed as a brewery, taproom and event venue. Drekker beer is handcrafted for the Viking in all of us. 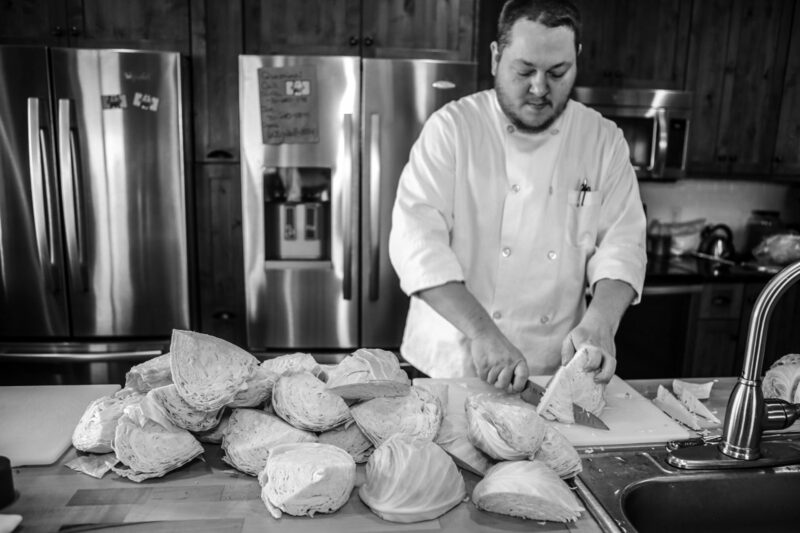 Chef Judd Eskildsen most recently lead the culinary team at Proof Artisan Distillers in downtown Fargo. He has taken on a new project as Director of Culinary for Brew Restaurants of Perham, Wahpteon and East Grand Forks, with restaurants and catering coming soon in Fargo. Judd’s rapid rise to notoriety in the Fargo food scene came as no surprise to dining guests here at the lodge who attended his previous dinners. Judd has accumulated an impressive collection of culinary awards in his relatively short time as a chef. Chef Judd in the kitchen at Coteau des Prairies Lodge. The event is on Wednesday, April 24th at Coteau des Prairies Lodge. Everyone is welcome, but space is limited and meals are available by reservation only. Alcohol will be served only to those over 21 years of age. The price is $70 per person. The meal includes a gourmet four course meal and 5oz. of beer served with each course. Water and coffee will be provided. Sodas and additional alcoholic beverages will be sold at the bar. Doors open at 5pm, guests are welcome to come early, tour the lodge and enjoy refreshments served at the bar. When you arrive at the lodge, sign your party in with our hostess. Guests will be seated for the meal promptly at 6pm. For reservations, fill out the online form below or call 701-680-1175.